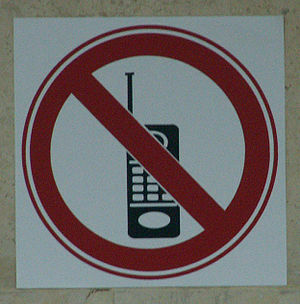 This morning I read a Wall Street Journal article about Americans without cellphones. Being an American without a cellphone myself, I was heartened to find out that a mere 88% of adult Americans have cellphones. I had thought the number would be much higher. And her dad was right, sometimes emergencies do happen. But emergencies by their very nature are rare, and I believe that cellphones take more than they give. Here are my four reasons why I’m glad that I don’t have a cellphone. 1. Cellphones rob us of our money. This was my original reason for giving up my phone. If my wife and I disconnected our landline and each got cellphones, we’d spend about $1000 more per year on the phone bill. To most people, that’s a lot of money. To my way of thinking, an extra $1000 will go further in helping with real emergencies than a cellphone will. In addition to the expense, now that I’ve ditched the phone, I realize that cellphones take a toll on less tangible aspects of life. 2. Cellphones rob us of our sense of place. Once upon a time, people invested time and energy in the idea of place. “Home” is the kind of place you have an emotional connection with. Americans have been bad at “place” for a long time. We wander too much, following jobs and dreams and rarely investing ourselves and laying roots in our communities. The cellphone has exacerbated this problem. I can’t even call “home” anymore. My parents have ditched their landline in favor of cellphones. Now I either call my mom or my dad. It’s just not quite the same. 3. Cellphones rob us of our ability to plan. Once upon a time, we had to know in advance where we were going and what time we’d be there. If you wanted to meet up with friends, you both had to be punctual. If you were heading to a new place, you needed directions before you left. How many times have you gotten the message, “I’ll just call you when I get close”? More convenient, yes. But I’ve noticed that this lack of planning spills over into other areas of life. 4. Cellphones rob us of our sense of adventure. Okay, so this one might seem to contradict my last point, but hear me out because I’ve noticed a certain lack of spontaneity in our cellphone culture. Once upon a time, when we found ourselves in an unfamiliar place, we could take some risks and see what happened. Now, however, when faced with the world outside, Americans retreat into the familiar space of their phones. No one risks conversation with a stranger. Why would we, when we carry all our friends and family in our pockets? The lure of the familiar keeps us from experiencing what the world has to offer. I’m no Luddite, but I think this particular technology takes more than it gives. Chime in and tell me what you think. Have I left something off the list? Or have I underestimated the benefits? Try to persuade me that I need to buy a new cellphone. I resigned from my position on Wednesday and left my cell phone with them. I should get bonus points considering it was my job to distribute the highest amount of cell phones possible to the public. At one point in time, we were cranking out a couple hundred per month. In your opinion, were those couple of hundred people happier and more contented after they left your store with their phones? Yvonne, I agree with your thoughts on parenting. I just wonder if I’ll still agree when my own daughters go off to college. Agreed that cell phones are a drag on finances and have destroyed our ability to plan. I would say that the internet has robbed us of our sense of adventure more than cell phones though. At least once a week someone stops and asks me for directions, but I don’t think many people just take a trip now without going online. I saw a tv show from the 90s a few months back and they were planning a road trip using a map and it looked so antiquated. Now you would just use Google maps or better yet, program your gps. You also can’t see a movie, eat at a new restaurant, or read a book without reading about it online-where’s the adventure in that? Big advantage to cell phone- NO SOLICITATIONS. Your comment about 90s TV is funny because I recently experienced a similar moment. The other day, we were watching the Cosby Show, and Heathcliff and Claire were looking for a place to eat in a restaurant directory. I’ve been thinking about this a lot lately! I’m really disgusted by how attached I am to my phone. Ever since getting an iPhone, I’ve spent a lot less time in deep thought. If I have a free minute, I use it to check Twitter. If I weren’t an RA that needed to be constantly available to 36 freshmen, I would love to get rid of my cell phone or, at the very least, keep it in my room. I still write down directions on a piece of paper before I leave, because I don’t have a smart phone or GPS. Jodey says I should at least print them out. There was another interesting article in the Wall Street Journal this weekend about how there has been a recent rise in injuries in children that may be related to parents who are distracted by their mobile devices. Patti, the Wall Street Journal seems to have a vendetta against the telecom industry. After I posted my blog, a friend pointed out that WSJ posted two videos (http://on.wsj.com/PeE9Nl and http://on.wsj.com/S6OBgf) and two articles (http://on.wsj.com/NPCaTN and http://on.wsj.com/NU3mRm) questioning cellphone usage. I will share that I wholeheartedly agree that technology, namely cell phones, robs us off our ability to properly interact with one another. To be friendly! To listen…actually listen! The connection we have as family, friends, acquaintances, etc, is so easily broken whenever we choose to idolize the latest model of an electronic instead of the former. I won’t try to convince you that you need a cell. I have a cell phone – I much prefer it to using a pay phone when I’m out – but I insist on it being a detachable item, especially when I’m around people -real, face to face people. It saddens me to see everyone with a phone in hand ignoring the person beside them – whether it’s at a restaurant, hanging out with friends, or in the living room with family. I don’t think I’ll ever get used to it. If I am truly honest, I resent cell phones. Or more pointedly, I resent how people use them. Great post! You’ve got me thinking about ditching mine. 🙂 Thanks for writing.